I just returned from a great week in Hawaii with Susie and her parents. We had not been to Hawaii before, so we chose to take a cruise around the islands to try and take in as much as possible. I’ve tried to limit myself in this blog to one or two photos a day (which was really hard given that we took around 1,000), but I put about 100 of the best photos on Picasa with some short descriptions if you are interested in seeing more of pictures. They probably tell the story better than these words do. I should also apologize for using words like “beautiful” too many times in what follows! 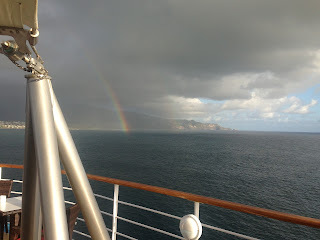 We flew from Raleigh to Dallas-Fort Worth and then to Honolulu on the island of Oahu and went directly to the ship, the Norwegian Cruise Line Pride of America. The ship is a fairly large one able to carry over 2,000 passengers. We were treated to a beautiful sunset as we left the harbor that set the tone for the trip. Our first stop was the island of Maui. We ran into another couple on our way off the ship and they invited us to rent a car with them. We agreed and they drove us on the Road to Hana which Jim had done on a previous visit to Maui. It is a very winding road, with lots of single-lane bridges, which hugs the coast line of Maui. There were plenty of places to stop along the way and see vegetation and waterfalls, though many of them were dry during this time of year. We saw black-sand beaches, plants that we were unable to identify, and gorgeous ocean views. The second day in Maui, I took an excursion and rode a bike down Haleakala. My Strava data indicates that it was all downhill and I only burned 67 calories during the 45-minute ride! There were stops to take pictures and lots to see, however, including a lavender farm. Susie and her folks visited the port while I was cycling and had fun making leis out of the local kukui nuts. Next stop was Hilo, Hawaii (commonly just referred to as the Big Island). We rented a car and drove up the coast to Akaka Falls which are over 400 feet tall. Along the way, we stopped on a 4-mile section of road designated as scenic. (Anything that is considered worth noting as scenic in Hawaii is not to be missed!) From the top of the trail, we were able to see sea turtles swimming in the ocean. Then, as we followed the trail, it felt like we were descending down into a jungle as the plants grew denser and things grew darker. At the bottom of the trail, there was a burst of light and a magnificent little cove with splashing waves. In the afternoon we drove the other direction from the ship to Hawaii Volcanoes National Park. There we saw steam rising from Halemaumau Crater in the Kileuea’s caldera and went through a lava tube that at one time had been a path for lava flowing from the volcano. That evening, as the ship sailed to the other side of Hawaii, it passed by a lava fall. Sadly, none of our photos worked out due to the darkness and the movement of the ship, but it was amazing to see in person. The next day we docked at Kona, Hawaii. This time we tried hiring a driver to take us around. We saw Kona coffee beans growing and being made into what we think of as coffee beans. We went snorkeling in multiple places and saw lots of fish. Susie even managed to step on a sea urchin and get some of its spines in her foot. Ouch! The next day we docked at the island of Kauai. We felt this was the most beautiful of the islands, though they was not an easy call. We again rented a car and drove first to Waimea Canyon which is sometimes called the Grand Canyon of the Pacific. At only 10 miles long, that is definitely an exaggeration, but it is as much as 3,000 feet deep, so it promised to be spectacular. As we drove up to the top, however, we ran into denser and denser clouds and finally rain. We were not able to see the deepest parts of the canyon, but were still able to see some spectacular vistas once we got below the clouds on the drive back down. We next visited the beach at Po’ipu for some more snorkeling. We did not notice until after the snorkeling that there was a large Hawaiian monk seal napping on the beach. At over 500 pounds with warning signs to leave it be, it is hard to believe we did not see it! Just when people were starting to ask if it was alive, in stretched, brushed its face with its flipper, rolled over, snorted, and continued to nap. In the evening, we went to a luau. We enjoyed the food (except for the poi) and the dance/production afterwards. The next day, we drove the other way around Kauai. By now, we were somewhat used to all of the beauty and though we had a pleasant drive to Hanalei Bay with nice photo opportunities, we felt it was not up to previous drives. That evening, however, the ship made a trip past where the road was able to go and we saw the stunning Na Pali Coast from ship. The Na Pali Coast is only accessible by sea, air, or foot and the views from the ship were the most beautiful that I have ever seen. The ship returned overnight to Oahu where it started. We took a bus excursion to Pearl Harbor, Honolulu, and some of the surrounding area. The memorials and exhibits at Pearl Harbor were informative and moving. I am always humbled by the sacrifices that so many people have made to ensure the freedom I enjoy. We then took our red-eye flight to Dallas-Fort Worth and finally back to Raleigh. It was a wonderful and memorable trip. And, though it was less relaxing than I had hoped, I finished three books and got close on a couple more. Great description of a wonderful trip- what a gift to have seen so many of our Creator's creations!